Bund Gardens from the Fitzgerald Bridge, Pune. bl.uk > Online Gallery Home	> Online exhibitions	> Asia, Pacific and Africa Collections	> Bund Gardens from the Fitzgerald Bridge, Pune. 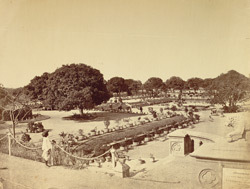 View of the Bund Gardens at Pune in Maharashtra from the Lee-Warner Collection: 'Bombay Presidency' taken by an unknown photographer in the 1870s. The gardens are situated next to Fitzgerald Bridge and take their name from the bund, or dam, on the Mula river. The garden was opened in 1869 when the bridge was completed. It was planned by Colonel Sellon who was able to transform the waste space into a pleasing garden.